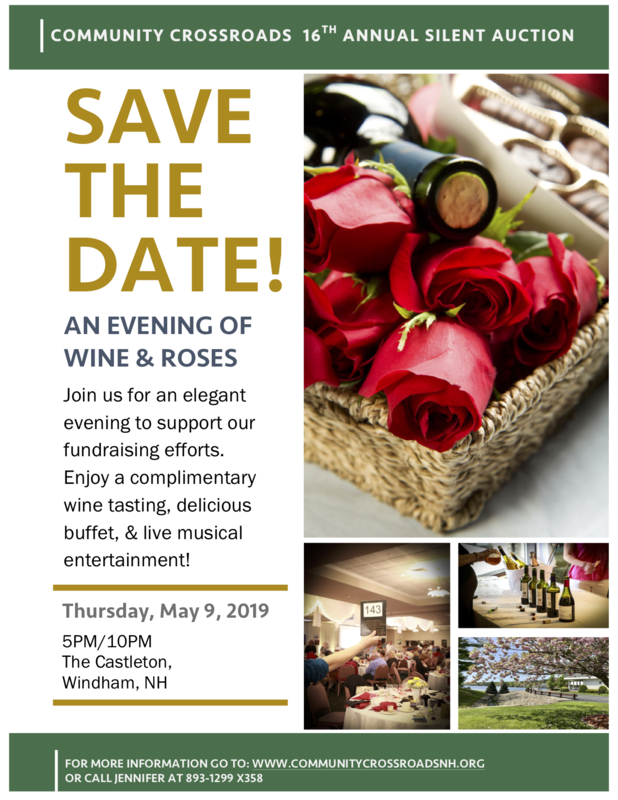 Join us for An Elegant Evening of Wine & Roses to support our fundraising efforts! The night consists of many Silent Auction items to bid on, raffles, sports memorabilia, wine and candy tables as well as live musical entertainment. An hour of complimentary wine tasting followed by a buffet and dessert promises an evening to remember! Enjoy An Evening of Wine & Roses and Help People With Developmental & Other Disabilities Live Full Independent Lives In The Community! Enjoy Wine Tasting, Live Musical Entertainment, & Buffet! Email jbertrand@communitycrossroadsnh.org your 5" X 7" Ad in jpeg, png, or PDF format by 4-18-19. Email jbertrand@communitycrossroadsnh.org your 5" X 3.5" Ad in jpeg, png, or PDF format by 4-18-19. Email jbertrand@communitycrossroadsnh.org your 3.2" X 2" Ad in jpeg, png, or PDF format by 4-18-19. We serve more than 1,200 individuals who experience developmental disabilities, acquired brain injuries, and their families in 11 eastern NH towns as well as adults with long-term care needs living throughout the state. With the help of Community Crossroads many children and adults are able to continue living at home. Support helps our individuals live and work independently as possible in their communities. We've been committed to our mission of guidance, support and advocacy for over 36 years. Through it all, our communities have worked along with us to support those in need. Your Donations of Items & Services, Advertising, Sponsorship and purchase of Event Tickets are critical to our success! It's with sincere gratitude we acknowledge the generous support of our Corporate Sponsor SOSSEC, Inc! We also sincerely appreciate the generous support of our Hospitality Sponsor Life Visions! 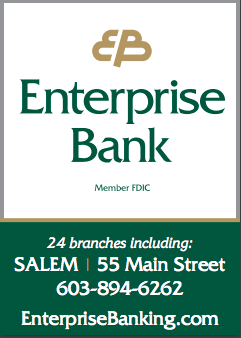 We also sincerely appreciate the generous support of our Program Sponsor Enterprise Bank Salem, NH!